Low nasal “cherr,” constantly uttered. Description: Sexes similar. 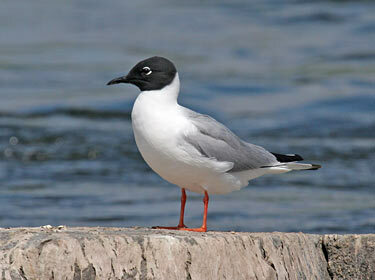 Breeding adult shows black hood, black bill, gray back, black wing tips, white underparts, and red legs. 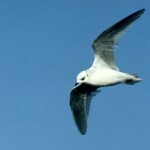 Winter adult is similar to breeding adult but lacks hood and has dark spot behind eye. Shows a white wedge on the outer wing edge in flight. First winter bird similar to winter adult but has brown on wings and pale pink legs. Habitat: Migrants can be found on larger rivers, lakes, and marshes. Where in Nebraska: Uncommon spring and fall migrant in the eastern part of the state. Rarer in west. 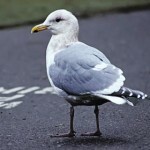 Fun Facts: The only gull that regularly nests in trees. 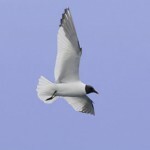 Additional Information: Sometimes called Sea Pigeon.